Light, is that which is manifest in itself and reveals its surroundings. 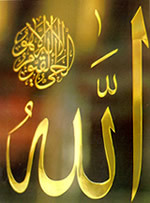 The LIGHT is one of the names of Allah Who endows His creatures with spiritual and concrete meanings of light. Allah is the LIGHT in every darkness, revealer of all what is hidden; He has lit the universe with suns, stars and moons; He has lit heavens and earth, and lit thebelievers’ hearts with the profession of monotheism. He reveals Himselfwith His overwhelming Presence and Existence, brings things out from thedarkness of non-existence to the light of existence. Existence itselfwas non-existent, and no darkness is more unfathomable than the abysmaldarkness of non-existence. Allah’s Existence is not preceded by non-existence and it is impossible that non-existence befalls His Existence; He is the LIGHT; He lights everything by letting them exist. Allah is the LIGHTand no existence is but derived and originated from His existence and nolight is but derived from His Light. Allah says, “God is the Light of the heavens and the earth. The parable of His Light is as if there were a niche, and within it a Lamp, the Lamp enclosed in Glass; the glass is as it were a brilliant star, lit from a blessed Tree - an Olive, neither of the East nor of the West, whose oil is well-nigh luminous, though fire scarce touched it; Light upon Light! God doth guide whom He will to His Light; God doth set forth Parables for men, and God doth know all things” (NUR, 35). He also says, “God is the Protector of those who have faith; from the depths of darkness He will lead them forth into light”(BAQARA, 257), “Can he who was dead be compared to whom We gave life and a Light whereby he can walk amongst men, belike him who is in the depths of darkness, from which he can never comeout?” (AN‘AM, 122), “There hath cometo you from God a new light and a perspicuous Book”(MA’IDA,17). Allah is the LIGHT; His Light, if it were revealed by Him, then the sublimity and the august splendor of His Countenance would set ablaze the end of the range of His creatures’ vision; Glory be the LIGHT, Praise and Glory be to Him, He is Allah. «(91) The Harm-INFLICTOR (AL-DHAAR) (92) The Benef..